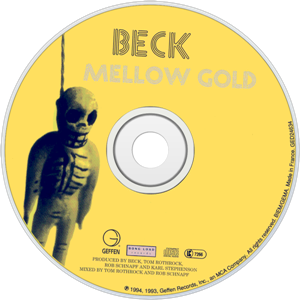 The stunning closing track from Mellow Gold, "Blackhole" remains one of the finest recordings Beck has ever created. The simple melody and hypnotic guitars create a beautiful and powerful atmosphere. Petra Haden, of that dog, adds some mournful violin to the mix. "Blackhole" shows the depth inherent in Beck's songwriting, even from his earliest stages. The song does not get performed live anymore, and was never a single, so remains a severely underrated highpoint in Beck's career. It appears to be a portrait of someone, seemingly homeless? Or perhaps young. Or both. The strength comes because the song is neither optimistic, nor pessimistic, in its portrayal, but honest and real. Blackhole" was performed regularly throughout 1994 and 1995. It was normally done electrically, with a full band. This ended up much more eerie and disorienting than the subtle beauty of Gold's acoustic guitars. Featuring a throbbing bass, electric guitar, and dynamic musical explosions after the verses, the grunge atmosphere was drastically different from the album's tender beauty. Don't get me wrong?it was still usually quite impressive. Unfortunately, "Blackhole" has not been performed at all in quite some time. "Blackhole" was a regular in the sets while Beck toured behind Mellow Gold. It was also one of the centerpieces of the shows. Beck rearranged the song to be a full electric powerful grunge song on stage. Such a drastic difference from the record! It's basically a whole new song. One of the earliest performances of the song occurred on June 29, 1994, in Minneapolis, just a few months after Mellow Gold was released. On that night, the song boasted an especially long bass intro. After about six and a half minutes, it segues directly into "Spanking Room," which, on record anyway, couldn't be a more different song. But on stage they fit together quite well. At the tiny Middle East club in Cambridge, MA, on October 28, 1994, the song "Maximum Potential" acted as the intro to "Blackhole." This was the best live version of the song I've ever heard: long, dark, dramatic and a bit creepy. The few 1995 versions that circulate sound much like the October 28, 1994 arrangement. "Blackhole" did not seem to survive past 1995 in the setlists, though I'm told on the Odelay tours, Beck did soundcheck with it for fun, and there are occasional reports of it popping up. No bootlegs I am aware happened to catch it if it did! For years, there were all sorts of lyrical transcriptions around the web. Beck's words on this one were somewhat obscured in the recording. However, around 2002 or so, Beck corrected the lyrics himself, posting them on beck.com. That is what is listed above.